Right smack in the middle of Ireland's jaw-droppingly doom-laden last couple of weeks there were a series of events organized by the Irish Technology Leadership Group. The ITLG is a non-profit organization of Irish and Irish-American Silicon Valley leaders whose objective is to foster links between Ireland and Silicon Valley that will help generate high-tech success stories for Ireland. To make this happen the ITLG assists Irish companies with marketing, fund-raising, developing strategic partnerships and other key commercial tasks. 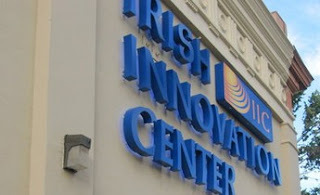 In addition, the ITLG opened the Irish Innovation Center in San Jose. The IIC, which opened in March, affords Irish start-ups a space in Silicon Valley, from where they can establish links that will provide these Irish companies with access to technology and connections that are vital for technology businesses today. The other thing the ITLG can provide is optimism. ITLG President John Hartnett, in particular, just oozes optimism. Hartnett bubbles over with excitement when he gets going. Hartnett's an Irishman who has done well in America, but that's not enough for him. He's keen to bring the rest of his fellow Irish men and women with him. He's all smiles when he is talking about the possibilities for Ireland in the 21st century, which stands in stark contrast to how most people in Ireland feel today. ITLG's Chariman is Craig Barrett, the former head of Intel. Barrett has a different demeanor, but is no less positive about Ireland's future. Barrett is like a hard-nosed football coach. He lets you know it's going to be a tough game, but he also has that top coach's ability to convince you that you will stop that fullback on the 4th down play at the goal-line. Both men are inspiring and Ireland sure needs a large dose of that right now. I also had a chance to sit with a couple of other members of the ITLG. They were also positive about the ITLG's mission, but it wasn't hard to detect some frustration. Too many "redundant conversations" - the same conversation with basically the same officials over and over - is what I heard. I can easily understand. The Irish government is like a fish on a hook - willing to listen, but not really able to do much. If anything made me uneasy about the ITLG visit it was that they would be sucked into the defeatism and pessimism that just seems to hang on the air here now like a foul-smelling cloud. You can't avoid it. It gets in your lungs and takes over your whole being. Ireland desperately needs someone to keep hope alive and the ITLG is doing that. I hope the small Irish companies they're dealing with can imbibe the ITLG's upbeat, American can-do attitude and not get dragged down by the all-encompassing negativity that currently stalks Ireland.